Ezhil Subbian is the CEO of String Bio, a company that provides a new way of using methane, a common byproduct of natural gas, biogas, and landfill gas, to chemically leverage value-added products such as single cell proteins for animal nutrition and polymers in a profitable way. Based out of Bangalore, India, Ezhil met Bertrand Piccard and the World Alliance Team during their trip to India in January in search of Indian solutions. 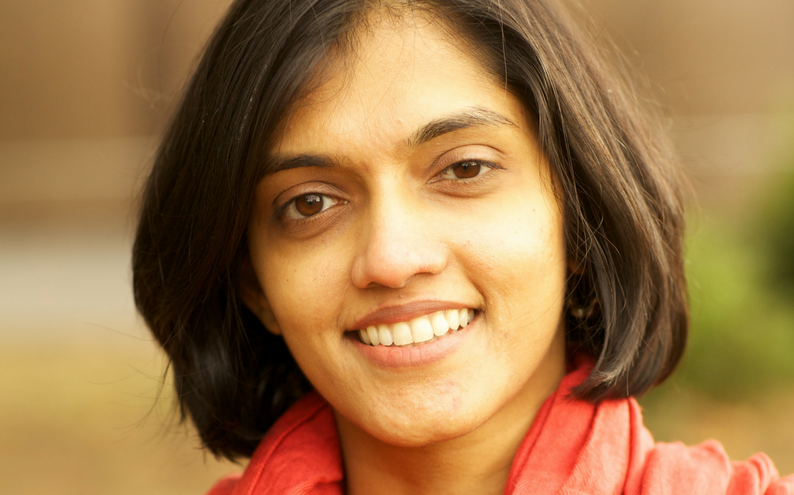 Having connected at C-Camp, String Bio has since become a member of the World Alliance, and we wanted to take a moment to highlight Ezhil and her team’s work. Where did your passion for biotechnology come from? String Bio itself, I continue to be enamoured by what is possible if we leverage biology, because I think a lot of what we are trying to do today, no one has previously solved and there are some very powerful solutions that exist in nature already. I think it is about taking those solutions and accompanying it with engineering and figuring out how to ensure that it makes economic sense. That is what drives me. Why did you decide to start a company to address environmental questions? As we started to look at the possible application of technology, we decided to hone in on methane because methane is a very interesting gas. It’s a high energy alkane that is currently largely underutilized around the world. We currently use natural gas to create power but a large portion of methane gas gets flared because we don’t have the right solutions to leverage this source of energy. So we decided to combine the power of biology to leverage methane to convert it into different value-added products. We focused on two key market areas: creating single cell proteins and chemical monomers. Why did you decide to focus your solution on using and converting methane? Methane can come from different sources: natural gas, biogas, and landfill gas. It is dangerous to release methane gas into the environment because methane is a much more potent greenhouse gas compared to CO2;. it’s heat-trapping potency is almost 30 times higher. What occurs today is that methane gas gets burnt off, called flaring, converting it to CO2, and consequently is released into the environment. So our thinking is why not leverage the carbon to make useful products instead of burning it off? When you use methane to make value-added products, you can make those products in a much more cost-effective way. Comparatively speaking, methane today provides the cheapest source of carbon. Let’s say that today we make lactic acid using glucose or sugars and tomorrow we decide to make lactic acid using methane – with all other factors remaining the same, the lactic acid made from methane can be made at a cheaper cost because the substrate is available at a cheaper cost. So that is our first driver: that these products have to match the same form, fit and function, but they have to have an economical advantage. Then of course, the environmental benefit also pulls us along. What stage is your solution at? We haven’t commercialised our technology yet, we are currently in the process of scaling up our technology and we are looking to have our first product from methane by 2019. Can you give us a concrete example of where this technology can be applied today? In the feed space today we are making a protein from methane. Today, the protein for the feed market comes largely from fishmeal or soymeal. Fishmeal is kind of the gold standard in the industry because it is a much higher quality protein compared to soymeal. Our goal was first to match fishmeal in terms of the quality of protein, and second to have a cost advantage. [Our] product is called StringPro, which is a protein made from methane for the feed market. Compared to fishmeal, our product is about 30 to 40% cheaper in the market today. In some ways, when you are making protein from methane, you are kind of industrializing the manufacturing of protein. This allows us to have more consistent production of protein because one of the challenges for the people who are the consumers of fishmeal in the market today is that there is a lot of variability in the supply chain. So what we give them is consistent product, output, but also consistent pricing over a long period of time. And I think the other big advantage we bring to the table is that it is a very traceable process. You can break it down to the elemental level, I can tell you where the carbon came from, where the nitrogen came from, where the oxygen came from to make this protein, which I think is one of the demands of the current and future market: we all want traceability in terms of the food chain. When you eat something you want to know where it came from, how it was grown, etc. I think that is another advantage of our process. It is cost effective, it is a more efficient protein, high quality, and it is also traceable. What sort of market could benefit from your technology? We have been talking to both large private and public players, such as oil and gas companies who are working with large volumes of gas. Often these players have a mandate to reduce the amount of flaring they are doing, both from a regulatory perspective and from internal mandates that push them to be more environmentally conscious going forward. How would you describe the change in the biotech and cleantech market in India over the past 10 years? I think the biggest change in the Indian ecosystem is that there is a lot more emphasis on innovation from a grassroots level and I think one of the advantages is that you will start to see solutions that are developed for this ecosystem rather than solutions that were developed for another ecosystem that were retrofitted to work here. I think one of the challenges for a market like India is going to be: how do you make the scale work? Because no matter what you do, it is going to be scaled to a large and diverse population. And I think perhaps the change could come from innovative solutions being developed from within India, and I do see a very positive change towards that; in terms of funding for more innovative solutions, in terms of government support, infrastructure in this area, and towards skill development. What is one of the biggest challenges in the biotech market today? There is not enough clarity in terms of regulation. If I want to scale my solution in India, I will need to consider what the regulations are that I need to adhere to, and how do I go about getting those approvals. That kind of clarity is still not there. Secondly, having a new framework instead of getting the old existing system to change. I think that we should have a new regulatory body that supports innovation and facilitates scaling up these innovative solutions. Do you see a lot of women involved in biotech innovation or cleantech innovation in India? I do see a lot more women involved today, however it is definitely a sector that is skewed towards men. In India, this is a very interesting question and I myself am trying to figure out how to encourage women leadership even within my own company. Because you do see women in this ecosystem, a lot of very strong women leading innovation, but those women are still working in a very patriarchal society, so sometimes I do find that perhaps there are occasions where for some of those women, career choices take second place to their husbands or their husbands’ career choices. So that is a challenge, as a woman I am trying to figure out how to encourage female leadership within my own community. So I do see a lot of women in this ecosystem, but not enough. There could definitely be a lot more. What drives your desire to continue to work within biotech and create cost effective ways of protecting the environment? My philosophy is to learn from everyday people. My favourite quote is from Viktor Frankl’s Man’s Search for Meaning, where I retain this classic phrase: “If you have a very well-defined why, you can overcome any how.” I think that as we continue to build this technology and this solution, we look towards the market and I keep going back to why we are doing this. Sometimes this helps us move into the next phase. As long as you have clarity on why, you figure out the solutions for each challenge that comes.